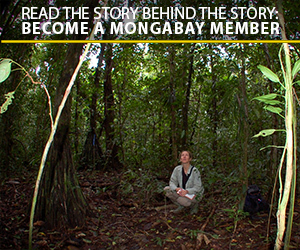 There are many important conservation and environmental stories Mongabay isn’t able to cover. Here’s a digest of some of the significant developments from the week. If you think we’ve missed something, feel free to add it in the comments. Mongabay does not vet the news sources below, nor does the inclusion of a story on this list imply an endorsement of its content. Invasive Burmese pythons are still a problem in the Florida Everglades, as evidenced by the 17-foot (5.2-meter) snake found there recently (The New York Times, The Guardian). Brazil’s president sought support from the U.S. for his plans to “develop” the Amazon (Thompson Reuters). Successful restoration of landscapes depends on the inclusion of the people who inhabit them, says the head of the Center for International Forestry Research (CIFOR Forests News). Community leaders in Peru are suing global polluters, borrowing a strategy that led to payments from tobacco companies for the health risks caused by their products (The New York Times). The Peruvian government agency tasked with ensuring timber harvests are legal will remain independent, which conservationists say will help protect the country’s forests (Center for International Environmental Law, WRAL). Canada has introduced a carbon tax (The Guardian). Apple says it’s working with suppliers to switch to renewable energy for manufacturing (The Washington Post). Despite the rhetoric in Washington, D.C., the U.S. military is still preparing for the impacts of climate change (The Washington Post). China is protecting its own forests while sourcing much of the timber it needs from Russia (The New York Times). Fences thwart migrating animals around the world, research shows (The Conversation, Open Access News). Keeping an eye on one of the world’s largest marine protected areas in Palau isn’t easy (Hakai Magazine). An alleged rhino poacher was reportedly killed by an elephant and his body eaten by lions in South Africa’s Kruger National Park (The New York Times). Authorities in California work to protect the state’s forests from poisoning by some marijuana growers (National Geographic). Japan will enforce new laws this July requiring carbon dating aimed at slowing the ivory trade, but conservationists say it won’t end the country’s ivory market (National Geographic). Researchers tag the cost of plastic pollution in the world’s oceans at $2.5 trillion a year (The Guardian). The reintroduction of Mexican gray wolves to the southwestern U.S. has led to a record number on the landscape (Associated Press). For the first time, a video captured a great white shark hunting in a kelp forest (The New York Times). After axing environmental regulations, U.S. President Donald Trump will likely tout the country’s clean air and water in his re-election bid (Bloomberg). The effects of vehicle pollution lead to 4 million cases of childhood asthma a year, scientists say (The Guardian). Banner image of a Burmese python in the Florida Everglades by U.S. Fish and Wildlife Service Headquarters via Wikimedia Commons (Public domain).